Belgaum Moto Sports Association & Goa Moto Sport Association presents Belagavi’s first Super dirt bike race – “Karnataka Invitational Supercross 2017 – Belagavi”. 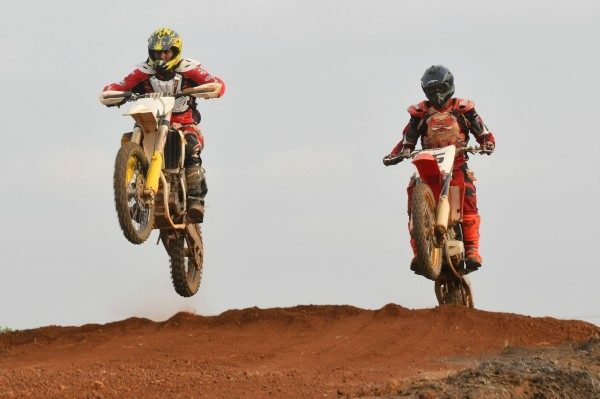 For the first time in the history of North Karnataka, the Federation of Motor Sports Clubs of India (FMSCI) approved event is taking place in Belagavi. Top National level riders from across India will be participating in the event. The Magadum SX race track has been designed & executed by the renowned International Track Designer, Mr. Ashley Gomes. race will be held Behind GIT College, next to Dnyan Prabodhan school, Sammed Nagar Udyambag, Belagavi at 3 pm on 21st May 2017. The organisers are expecting a crowd of 20,000 people to attend the event. The event shall have free entry for the general public. Belgaum Moto Sports Association President Akshay Magadum, along with the team Abhishek Magadum, Aditya Magadum, Shiv Mamadapur, Abhijeet Magadum, Vinay Magale, Suprit Magadum have been working in coordination with Goa Motor Sports association’s President Ashley Gomes over a year to bring this event to Belagavi. BMA & GMSA plans to launch the “Karnataka Invitational Supercross Championship” in November 2017 in their permanently built race track at the above said location. • Group A, Sx1 upto 250cc 2 stroke & 450cc 4 stroke. • Group A, Sx2 upto 250cc 2 stroke & 450cc 4 stroke. • Group A, Sx3 upto 250cc 2 stroke & 450cc 4 stroke. • Junior 1, group A/B/C/D upto 125cc 2 stroke & 250cc 4 stroke (under 18 above 15). • Junior 2, group A/B/C/D upto 85cc 2 stroke & 150cc 4 stroke (under 15 above 12). • Junior 3, group A/B/C/D upto 65cc 2 stroke (under 12 above 7). • Group C, upto 250cc (2/4 stroke). • Group B, upto 250cc (2/4 stroke). • Enfield Class, upto 500cc. • Women’s Class, upto 450cc. This race will be held under the supervision & inspection of FMSCI Scrutineers / Stewards. This event is being under the International sporting code of the Federation Internationale de Motocyclisme (FIM) the National Competition rules of FMSCI (NCR), & its appendices and the supplementary regulations.